The 3D Airway Model is a highly physiological, three-dimensional cellular system of Human Bronchial Epithelial Cells (HBEpC). The model facilitates in vitro examination of epithelial function and disease, including airway infections, tissue repair mechanisms, signaling changes and potential treatments relevant to lung injuries. Other investigations utilizing the Airway Model include mechanical and oxidative stress, inflammation, pulmonary diseases and smoking. The cells are grown and differentiated into a pseudostriated epithelium on PCF inserts with a liquid/air interface. Contact us for more information. (Click to Enlarge) A. Depiction of Human Airway. B. Human Bronchial Epithelial Cell (HBEpC). C. Crystal Violet Staining. D. Hematoxylin & Eosin Staining of HBEpC differentiated into pseudostriated epithelium after 28 days. 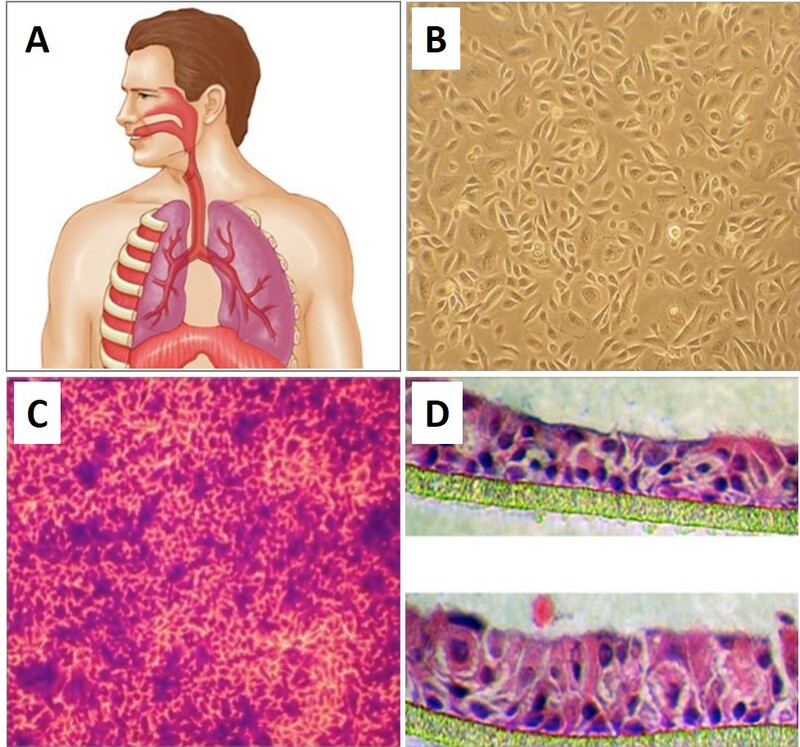 The Airway Model (Domestic US) consists of HBEpC differentiated into a pseudostriated epithelium, whereas the Total Kit (international customers) contains Cryopreserved HBEpC, media, twelve PCF inserts, reagents, subculture kit, and detailed instructions to form 3D Airway Model. Song, H., H. Wan, Y. Araya and D. Perez. 2009. Partial direct contact transmission in ferrets of a mallard H7N3 influenza virus with typical avian-like receptor specificity. 2009. Virology Journal, 6:126. Wan, H. and D. Perez. 2007. Amino Acid 226 in the Hemagglutinin of H9N2 Influenza Viruses Determines Cell Tropism and Replication in Human Airway Epithelial Cells. J Virol, 81:5181-5191.